A group of spinning neutron star pulsars, dubbed the "Magnificent Seven", pose a puzzle for our understanding of how these extremely dense objects form and change with time. Though these objects emit high energy X-ray and Gamma-ray radiation, unlike most pulsars they show no signs of emission at lower-energy radio wavelengths. Unlike other pulsars, their X-ray brightness does not seem to depend on the energy derived as the pulsar rotation slows with time. They also all seem to have relatively long spin periods (on the order of a few seconds) and seem to possess strong magnetic fields. It is possible that changes in the magnetic fields of these pulsars might explain their peculiarities. Another model suggests that some of the material expelled during the supernova explosion that created the neutron star falls back onto the neutron star and helps power the high-energy emission. A new observation with the Hubble Space Telescope has now provided some support for the "fallback model". This observation detected an extended hot structure emitting infrared radiation around one member of the "Magnificent Seven" pulsars. This structure might be a disk of hot dust produced as dust-rich material from the original supernova falls back onto the central neutron star. 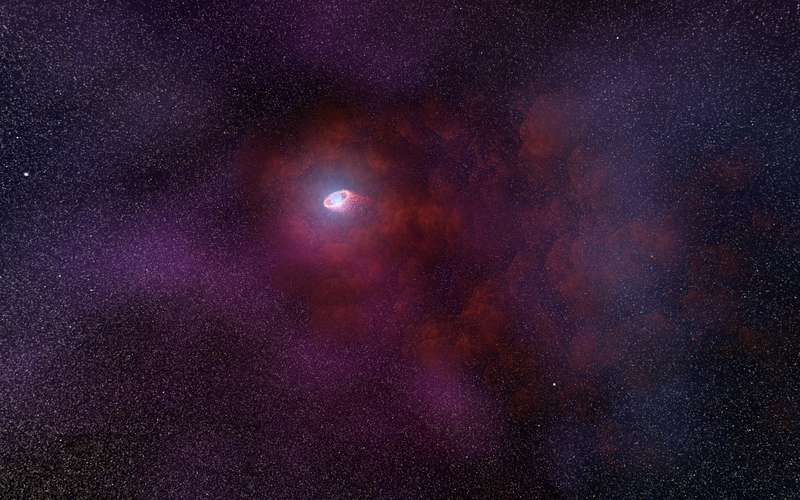 The image above is an illustration of what such a "fallback dust disk" might look like. The case is not closed, however, since the extended, infra-red emitting object could be a close, low-mass companion star, or might be produced by a wind associated with the pulsar, an outflow rather than an infall. Additional followup observations may distinguish between these models, and may help show whether material expelled by a powerful supernova can actually fall back onto the scene of the crime.